From simple upgrades to complete website redesign, GeoDigs provides a variety of services to best suit your Real Estate needs. 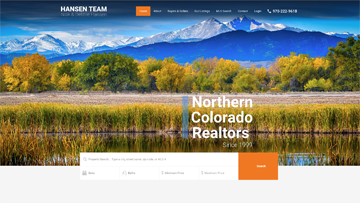 Using complete REcolorado and IRES MLS IDX website solutions, we bundle content, searchable listing data, and property images into one easy-to-navigate website to increase your traffic and sales. Whether you are searching for a WordPress template or a completely customized website, GeoDigs will provide all the IRES MLS IDX integrations needed to help your company thrive and expand. Choose the best for your company. Choose GeoDigs. GeoDigs pulls property listings off of the real-time REcolorado and IRES MLS IDX, providing combined search results that are updated every 15 minutes. Using the MLS IDX, all of your features, including interactive map displays, listing updates, and search engines, will always be up-to-date. With the option of putting your website on a WordPress template, your website will be easy to edit and always update automatically to keep your website in the most up-to-date format. Choose from hundreds of available templates to find the one the best suits your real estate needs. With Geodigs, you can include all current MLS data and search functions in your own website with your current domain name. Our monthly service goes beyond an initial design and web hosting. We provide the customer service and full support of our team for the same cost of other companies monthly hosting fees. Go above and beyond the standard and let GeoDigs make your image become a reality. Our goal is to give your business the best service possible. If you've ever had to deal with long waits on the phone, automated help systems that offer lots of hassle and very little help, or impersonal customer service, you're ready for something different. GeoDigs really is different. GeoDigs puts your business ahead of the competition with the latest in MLS technology, giving your website the edge to put you ahead of the game with our always up to date tools integrated into your custom design created to your specifications. Our monthly service goes beyond just an initial design and web hosting. GeoDigs provides the customer service and full support of our team for the same cost of other companies monthly hosting fees. Go above and beyond the standard and let GeoDigs make your image become a reality. With our different available options for your new web design, you get to choose the package that best fits your need. We offer WordPress plugins that are easy to edit and always automatically update listings and locations. For those that have a more specific design in mind, GeoDigs is able to create and develop custom sites using our latest tools to give your design the upper edge. Choose from one of our THREE PACKAGES for YOUR website! Geodigs plugin and WP Installation of theme of your choice. SteveRemmert.com. The Steve Remmert Group is built on the principles of Integrity and enthusiasm for their profession. This site features custom searches, listing alerts, a favorites list, and a custom mortgage calculator. LynnRyanBoulder.com. Lynn Ryan has been involved in real estate and building for over twenty years and has extensive experience in remodeling and new construction in both the City and County of Boulder. This site features property searches, Google maps, a mortgage calculator, listing alerts, and featured listings. J-MacoBoulder.com. John McElveen has 33 years experience in Sales throughout Boulder County spanning from new condominiums to Historic Homes. This site features property searches, a mortgage calculator, Google maps, and automatic MLS IDX Listings. LaurieKaufman.net. Laurie Kaufman is an experienced real estate agent with a goal of making a buying or selling experience as stress free as possible. Her site features a custom mortgage calculator, beautiful image slideshows, as well as current and sold properties. KidderPlus.com. John and Kimberly Kidder are a dynamic father daughter team who's commitment to their clients are their top priority. 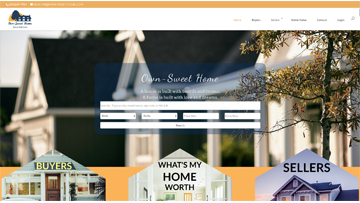 This site features dynamic content with personalized listings for each of their agents, as well as both current and sold properties. OldTownRealEstateCO.com. 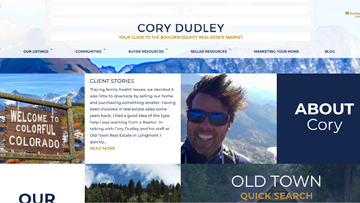 Cory Dudley is the broker/owner behind OldTownRealEstateCO.com. This site features custom searches, as well blogs and newsletters about current events in real estate that is designed by Tool Studios, one of New Media One's MLS design partners. HansenTeamRealEstate.com. The team of Nick and Debbie Hansen specialize in real estate for the Colorado communities of Loveland, Fort Collins, Windsor, Greeley, Frederick, Wellington, Red Feather Lakes and Longmont. Their site features beautiful transitioning images, home MLS IDX, as well as a custom video. BarbaraSilverman.com. Barb Silverman fell in love with Colorado when she came to the University of Colorado at Boulder, and transitioned effortless into an industry she is extremely passionate about. She holds in the highest esteem her clients’ confidence and trust. To get started designing your custom website, please fill out the form below with any information you have and we will get in contact with you as soon as possible! To speak directly with one of our representatives, please don't hesitate to call us at the number provided below. Please include in your message any relative information to the project (i.e. business name, any deadlines, how you prefer us to contact you, what time of day you're available, etc.). This helps us to better understand what exactly you're looking for in your design and new website.